Earlier this week astronauts aboard the International Space Station ate fresh food grown in space for the first time. It’s an exciting accomplishment and will be crucial for the survival of the first crewed missions to Mars. But it’s been a long time coming, as we can see from this 1959 comic strip depicting the “space farmers” of the future. The May 10, 1959 issue of the Sunday comic strip Closer Than We Think promised that space crops would soon become the norm. Space farmers would populate the many outposts between Earth and distant planets, allowing travelers to stop and get some fresh food on their way to important futuristic-sounding businesses. Agriculture will be literally out of this world once space applications become somewhat more advanced. Writer Frank Tinsley has described how farmers might develop new crops on satellite way stations between earth and distant points in space. Vegetable-like foods would grow in thick clusters of tubes filled with solutions of the sort already being used for “hydroponic” farming (which is another name for the growing of crops in nourishing liquids rather than soil). We often see conflict between the two competing space food futures. On the one hand there are the completely synthetic “meal-in-a-pill” space explorers who never see a green vegetable in all their travels. And on the other hand, there are the “just like Earth” space explorers enjoying naturally grown fruits and vegetables farmed in ways not too different from the way things are done in labs at home. 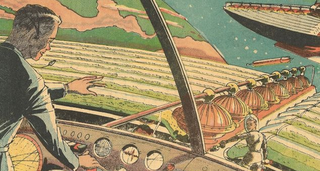 We’re still a long ways from having the expansive space farms depicted in mid-century comic strips. But with the crew of the ISS munching on fresh lettuce this week, hopefully the future really is closer than we think.